Chicken on the grill is a wonderful option for RVers who prefer to keep the cooking outside. Skinless, boneless breasts may be great for baking but true grill connoisseurs know that the bone and skin are necessary for a juicy and flavorful result. 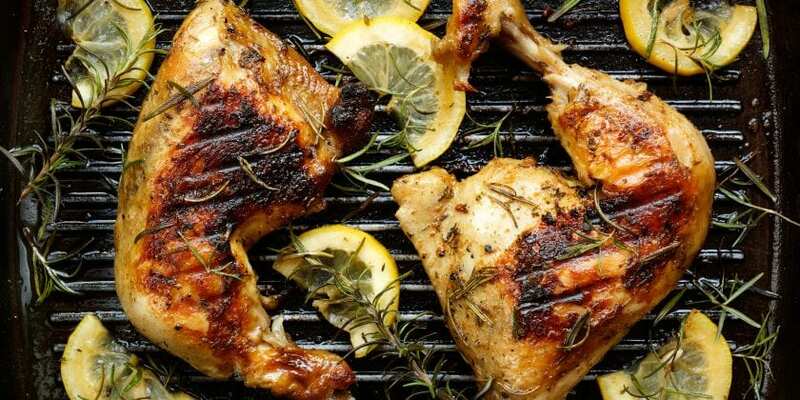 Topped with a light marinade of lemon, garlic and rosemary, this is sure to be a hit at your next meal and perfect for special occasions or weeknights at the camp alike. Use a garlic press or finely chop the garlic and mix with the oil, rosemary Dijon mustard, lemon juice, salt and pepper. Set aside about 1/8 of a cup of the marinade. Place the chicken in a large resealable plastic bag with the remaining marinade; shake and massage the marinade into the meat. Let the chicken marinate overnight if possible or as long as you can. The last 30 minutes, sit it out and allow the meat to come back up to room temperature. Preheat the grill to medium-high heat and lightly oil the grate. Cook the chicken over the hotter part of the grill for 6-8 minutes per side until it is lightly browned on both sides. Move the chicken to the cooler part of the grill, skin-side down with the fatter side of the breast facing the heat. Cover the chicken with aluminum foil and continue to cook until a thermometer placed into the thickest part of the meat reads 150 °F. Brush the bone-side of the chicken with some of the reserved marinade and place, bone-side down back over the heat. Cook about 5 minutes until it is evenly browned. Brush the skin-side of the chicken with the remaining glaze, and flip the skin-side down over the heat. Grill another 5-6 minutes until a thermometer placed into the thickest part of the meat reads 160°F. Transfer the chicken to a serving plate, skin-side up and sprinkle with a few sprigs of fresh rosemary. Serve with a salad for a light, no-mess, no-fuss dinner. Enjoy!